The afternoon of August 26 saw the fun sports meet of Dongguan Biotech held in the Basketball Gym of Songshan Lake Experimental Primary School. The sports meet was organized to enhance the collaboration ability and cohesiveness of employees and enhance their emotional exchanges, and enrich their sparetime life. After the team presentation and warm-up exercise, the sports meet was kicked up. Demonstrating an unstoppable momentum, the employees had achieved so much more than expected. 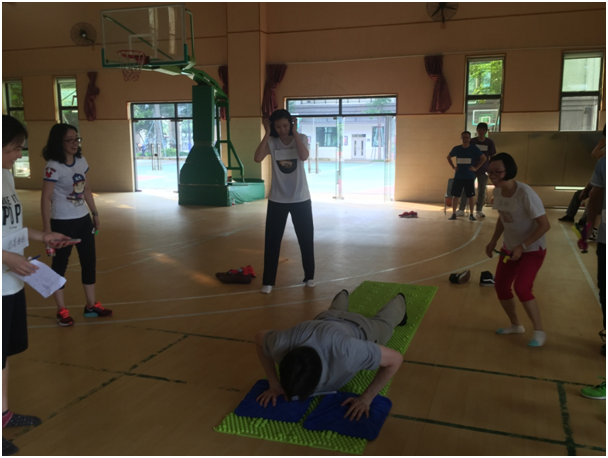 The sports meet was composed of five games, four-legged race with three people, retinue before and behind, fun shooting, shiatsu platechallenge and kangaroo going home. Sparing no effort to finish the game, our employees strived to win great scores for the team. The spectators cheered for their team members on the sideline. After intense and fun competition, our employees good at sports won the championship. Despite of the scorching heat, we have had laughter and felt the power of a team and the warmth of the family through the sports meet. May we march forward with such optimism and team working spirit!